What does the Bible say about marriage? What did Paul mean that it is better to remain single? Did he mean that singleness is preferred above marriage? What are biblical principles and guidelines for both husband and wife? How can divorce be avoided? Does God permit divorce? Is marrying outside of your faith biblical? Better to be Single or Married? Many people have taken out of context of what Paul said as he wrote in I Corinthians 7:8-9 “Now to the unmarried and the widows I say: It is good for them to stay unmarried, as I do. But if they cannot control themselves, they should marry, for it is better to marry than to burn with passion.” In verse 7 of I Corinthians Paul says that “I wish that all of you were as I am. But each of you has your own gift from God; one has this gift, another has that.” Paul does not forbid nor does he encourage marriage unless you can not control your own sexual urges (v 9). When two cords of husband, and wife bound together, they are not easily broken, and when three strands are woven together, these three cords are not quickly broken. 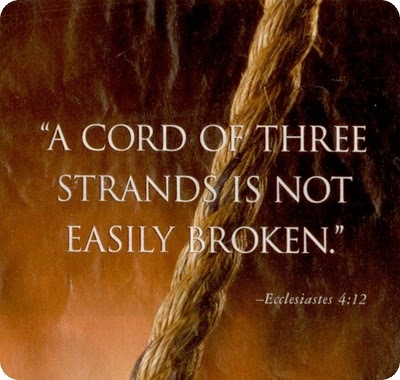 If the third cord or strand is God, then three are better than two. And even the Devil can not break what God has joined together. 5 Bible Stories about Love– Look at these five powerful Bible stories that exemplify what love is. Sam, thank you sir for your comment and for visiting the website. I appreciate your kind remarks and hope you will come back again soon to visit us. I am studying the cord of three strands and I appreciate your section above on that. Would you please comment on this: for a marital style of relating to be acceptable, the relationship of the husband and wife must mirror the style of relating between God and His children. Thank you for your time and consideration. These two articles most certainly go into more depth in this area of the relationship of the husband and wife that mirrors the relationship between God and His children. It may give more than this single article in your study of this “Cord of Three Stands”. I appreciate your desire to know more about this and hope that these two articles provide you more of what you are studying here both from the husbands and the wives perspective. Thank you Mr. Katzen. I hope this helped in fulfilling your request sir and if not. please let me know. Please come back again to visit us. I got born again when my husband left and I stood for my marriage for 10 1/2 years and after the second child I felt that I was not able to stand something in me happend and I divorced my husband. 6 year later remaried. does that mean that God hates? I read in the bible that if the husband does not want to sta to let him go how do you explain that Im not shure what he means about except for adultery. So where do I fit in am I in truble? That’s good news for all of us. He forgives us for ALL of ours sins and cleanses or purifies us from ALL unrighteousness. Don”t worry about where you fit in now…just look ahead and try to be the best you can be in obedience to God from today onward. Don’t worry about past sins once you’ve asked for forgiveness for God forgives and forgets them. Thank you, very helpful. I am getting married soon and my fiance and I are both followers of Christ. We hope to do our best to live up to the standards of God. He is indeed the strength of us. Thank you Pastor. There are few things that I enjoy more than weddings for they picture Christ marrying the church, which is called the Bride of Christ. May God bless you sir. As I celebrate my 5th year in marriage this December 1, 2012 I thank God for all His blessing toward my family and I am blessed exceedingly by reading this article; Cord of Three Strands. I married a man 20 years younger than me. From the beginning he was dominating and aggressive. Everyday he got stronger and I got weaker. I left him and he asked me to come back. But when I cam back it was to a man who no longer loves me. He is only willing to have sexual relations with me. I am not sure what to pray for. Because of the age difference and the abuse – my instinct is to let him go. But all the Christians around me tell me to hold on to him. We have been together for 10 years but I have been so unhappy for most of that time. I moved very far to be at this side but was very poorly welcomed. His mother, aunts, uncles, friends, colleagues and so other many people hate me and disapprove of me. But I am so distraught by the situation it is very hard to face everything alone. I seek God’s guidance, but I am not getting any sign. Hello Vivica and thank you for your question. Let me ask you because you didn’t specify this. Are you still legally married? Regardless, if this man is abusing him, you need to turn him into the police. No one should be abused because this is a criminal offense and this man needs jail time. If he is abusing you, please leave him right now. I am not saying divorce him but you need to get out of that home and file a police report, take pictures of the abuse he ha done to you. If you read Romans chapter 13, he is breaking the law and needs to be convicted…and in the meantime, don’t worry about a divorce right now…just get out of there…and call the police. I am a man and in a situation similar to Vivica where I am married in 20 years. My wife accused me of being abusive but she defined abuse by her own definition to fit her needs. I have never hit her, call her names or do anything remotely crazy but have always being home and provided for her and children. I have my own faults and I am not denying them but we grow apart as couple over the 20 years and she is using abuse as a way to justify the divorce. Because I see a lot of the same words you used that I am being accused of (Abuse, Dominate, agreessive etc) and I don’t know how your husband’s true condition. I just want to let you know our hearts is deceitful and it can lead us to believe wrong things. But God’s principal is always true if we use it in His way. If he is truly abusive, then Jack’s advise is a good one. But if he is not, as Christians, we need to uphold our vows to God and live according to his instructions to us. Even if your hubby is abusive, if you turn him from his error ways (repent), the whole haven rejoices with you. Don’t let happiness and fairness be your guide in marriage but let God and his word in the Bible be your guide. God does not make mistakes for putting you guys together. All things works good for those who loves Him. Pray for your husband he will be spiritual mature so to “Love your wives as Christ loves the church”. Let your marriage reflect God’s image. Thank you Jack for this site. I have benefited much. Mr. Otsay…you are so encouraging and we need this so much today in the church and among believers. Yes, God’s principal is always true. What you said is so full of wisdom. If husbands would truly love their wives as Christ loves the church, the divorce rates would fall. Thank you for adding some positive words to this discussion sir. I love this Article and I will follow this Message from God for all the days I am Married.. Coming from a broken home My soon to be Husband and I know the Importance of being Married.. Thank you Mrs. Brookins. I believe that divorce rates would plummet within the church if we had God as that “third cord” in our marriages. Marriage is a miracle in itself and being human, it is made more difficult, so without God, it is so much more difficult. May God richly bless your marriage Mrs. Brookins. Thank you. This is 1 Peter 3:1 and following. Not 1 Corinthians 6. That being said, truth is truth even if the reference is incorrect. Well done! Got it taken care of sir. Thank you Mr. Pearce for your patience with us. I have been married to my husband since 09/17/11. We are currently seperated and headed for divorce. Since seperating, we have both begun to draw closer and grow in our respective walks with God. He still believes, however, that we should divorce. I love this man and do not want the divorce. I found this article about the 3 Cord Strand while searching for direction on what I should do. I want to share this with him, in the hopes that it will change his mind. Are there any other things I might could share with him that might help? Thank you Amanda. I would certainly speak with your pastor about his. Your husband is not really drawing closer to God because if he were he’d know that he has not reason to divorce and this is clearly sin. I would tell him that if he divorces and there are no biblical grounds, then he is sinning and cannot marry again without committing adultery. He is just “talking” about drawing closer to God for those who are close to God are more obedient to Him so your husband’s words contradict logic and Scripture. I enjoyed your blog on three-strands. A major part not discussed in your article is the “evil” that would overcome us, if we were not three-strands. My wife has separated from me without cause. She is willful and acting independent of Christ, all the while claiming His authority in what she is doing. There is an entire new movement within Christian female circles where they use words like “abusive”, “aggressive”, “violent” according to their own definition. Many courts today favor women and are slanted in their direction when it comes to so-called judgment. I want my marriage to succeed and thrive, but my wife’s will is turned to do the will of the enemy…he is the one who separates and destroys marriage; we simply agree with his plan for us. The recent number I saw for divorces in my state is 80% chosen by the woman. That says all that needs to be said in this area. It brings me back to the fall, where the LORD told Eve that her desire will now be to be over her husband, but that she would be subject to him: meaning she will want to rule him, he will want to control her. Both sinful reflections of the fall in the garden. Women’s roles and attitudes MUST be addressed along with the man’s role in loving his wife like Christ. I have lots of room to grow in that category (which man doesn’t? ), but I believe she still would have left, for she is double-minded in her thinking. I didn’t say adulterous, although she does act as one outside of our faith, even though I know she is Father’s daughter. Thanks for listening to my plea…I look forward to your response. Hello Mr. Trevisan. I am sorry for your wife’s rebellion but there is little you can do but pray and trust God. God alone can change the human heart (Prov 21:1). All you can do is pray for her to repent. Has this woman ever repented and trusted in Christ? If you read 1 John chapter 3, does she live this out? What did your own pastor say about her after you spoke with him? Did you speak with him about this? I agree that a woman’s role is to be taught and so too with a husband loving his wife as Christ loves the church, so all you can do is pray for her to be saved (as it doesn’t sound like she is). Remember that Jesus died for us while still ungodly, wicked sinners of whom we were all His enemies (Rom 5:6-10) so that is what we must do too, even with a rebellious wife. My daughter recently married and lives over 1100 miles from her mother and me. She and her husband know the Lord, but marriage can put a terrific strain on a relationship if it is not anchored by God’s word. “Christian Advice for Newlyweds:10 Helpful Tips”, each week. Thank you for this resource.